Explanation: Does the surface of Mars change? 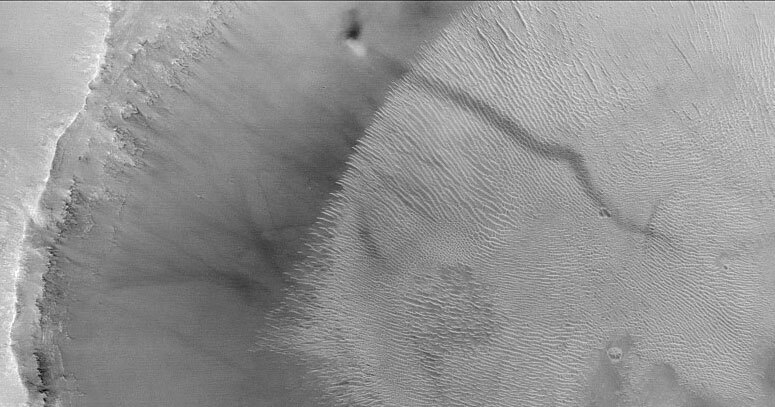 When inspecting yearly images of the Martian surface taken by the robot spacecraft Mars Global Surveyor currently orbiting Mars, sometimes new dark trails are visible. Although originally a mystery, the culprit is now usually known to be a dust devil, a huge swirling gas-cloud with similarities to a terrestrial tornado. Pictured above, a recent image has not only captured a new dark trail but the actual dust devil itself climbing a crater wall. Dust devils are created when Martian air is heated by a warm surface and begins to spin as it rises. Dust devils can stretch 8 kilometers high but usually last only a few minutes.